She requested a couple of photos to make sure it was what I need. I am hoping that it the correct one and that I will have a reasonable price quote tomorrow morning. I will talk to her again in more detail about the engraving work to a smaller Kranz. 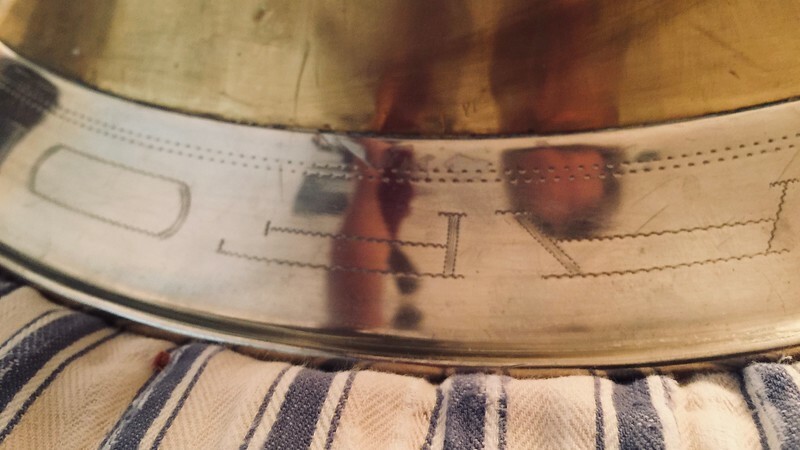 Perhaps the engraving will look original? I guess I won't know until I hear more from her. She made it sound like it might not be worth the money, but I may have misinterpreted her meaning. Also, I received some small parts in the mail so that I now have all the Minibal bits and pieces needed to finish my 5th valve push rod linkage on the CC and to do all five rods/ten ends on the BBb. Still waiting on two big packages. Last edited by the elephant on Sat Jan 26, 2019 4:00 pm, edited 1 time in total. My order from Badger hit my account today and the parts have been shipped. Just waiting for Wessex to contact me about my parts from China that Chuck kindly pulled for me. The ball has been rolling, but it is now picking up some speed. Today I heard back from Wessex with the invoice for my 5th slide parts. Thanks Steve and Chuck! Just waiting to pay. 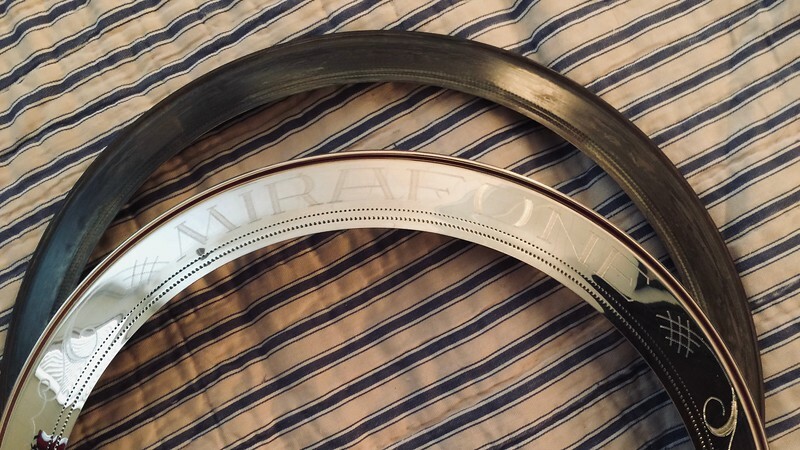 Still waiting to hear back from Eva at Miraphone regarding the engraving and the order I need to place. Today the parts from Wisconsin arrived. Here are some pics for those of you who wanted to know what unfinished factory parts look like. These generally are sold to shops, so the customer never sees what they look like prior to fitting to the horn. Once again, the reason I decided to make the BBb parts pile into a functioning horn again is that I had already planned to pimp out my 186 CC, and the parts I am replacing are mostly trim that protects the instrument, but they also have a lot to do with how the horn looks. If I want to put all the time into fixing the bell and outer branches to look as good as possible, I will have to remove these parts. Anyway, since the parts on the CC are in reasonably good shape but are scarred up enough to look every bit of their 48 years of age, and the BBb horn's same parts are pretty much trashed, the current parts that will be replaced on the CC will be cleaned up as best I can and transferred to the BBb. They fit. I checked just now. 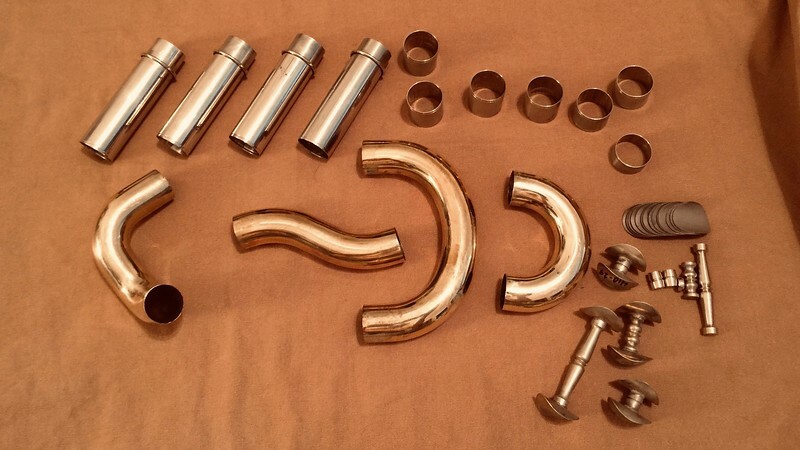 The photos are of the new parts for the CC and the old BBb parts that will be rotated out of use. 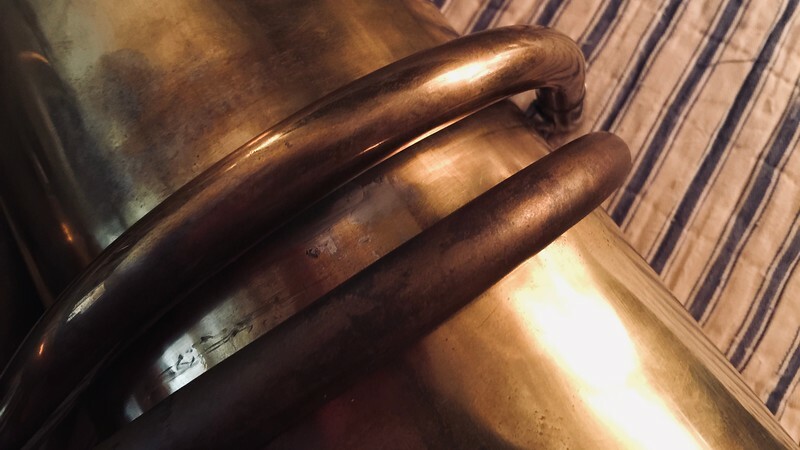 The exception is the Kranz, which is going onto the BBb tuba's bell, now that the cracks and holes have been repaired (sort of). Here is the end of the bottom bow guard. 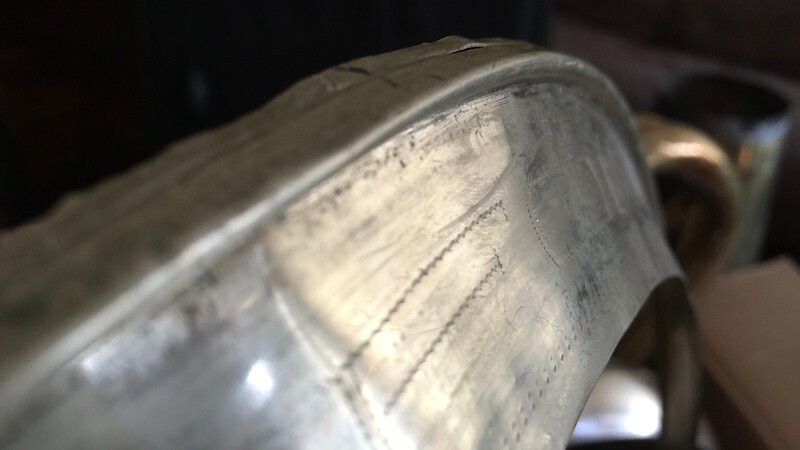 You straighten out the old one as best you can and make sure that even if the tube curve is toast that it closely conforms to the bottom bow curve. You then hold it in place and mark the end locations and shapes and you cut it out. Also, you can slide it over the bow and mark it based on the underlying solder pad, but this is much harder to do. I slipped this over the BBb bottom bow and it fits perfectly, probably requiring only three wires to hold it to the bow with no gapping when it is installed. I love new parts! Here is the end of the top bow guard. I will net a nice cache of both new and old leftover nickel silver sheet stock after this work is done. Note how deeply the keel was crushed into the bow guard. The bottom bow in this area has like 15 or so cracks around this area. 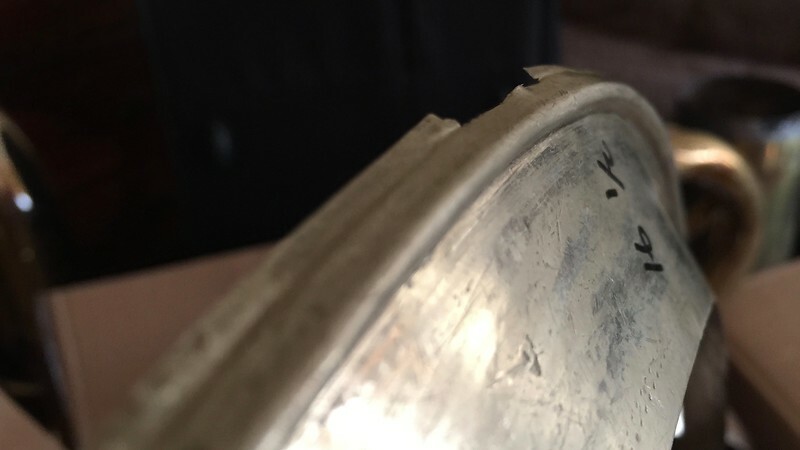 It is almost like a perforated postage stamp or an electrical junction box knockout plate; one good hit and you would have a six inch hole in the bottom bow. This was sold to me as a parts horn for a reason. There are a lot of holes and cracks in the outer branches and bell. 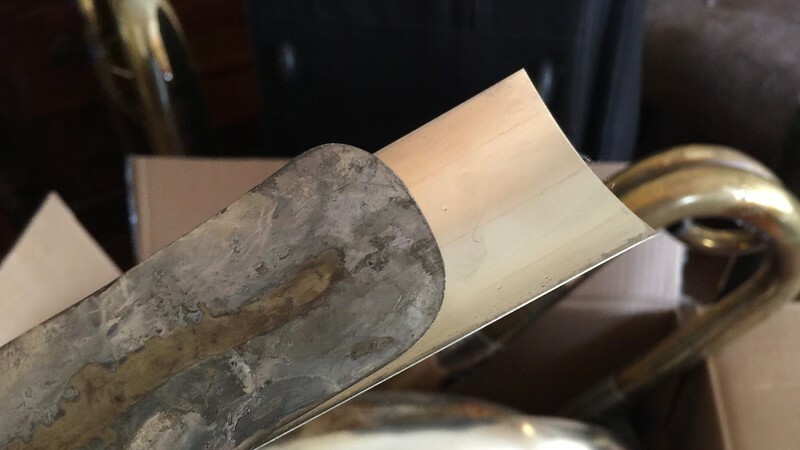 With the labor to repair the most expensive parts added to all the parts needed to replace missing or broken ones it is just more than it is worth to fix up this old horn. 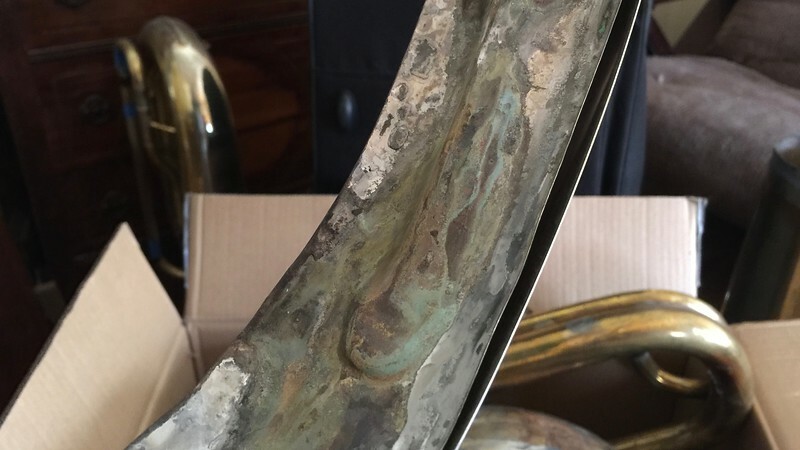 However, since I am already restoring the CC I have most of what I need for this tuba, so all the work needed to fix cracks and holes is now worthwhile and makes more sense. These shots show why I had to replace the old Kranz. 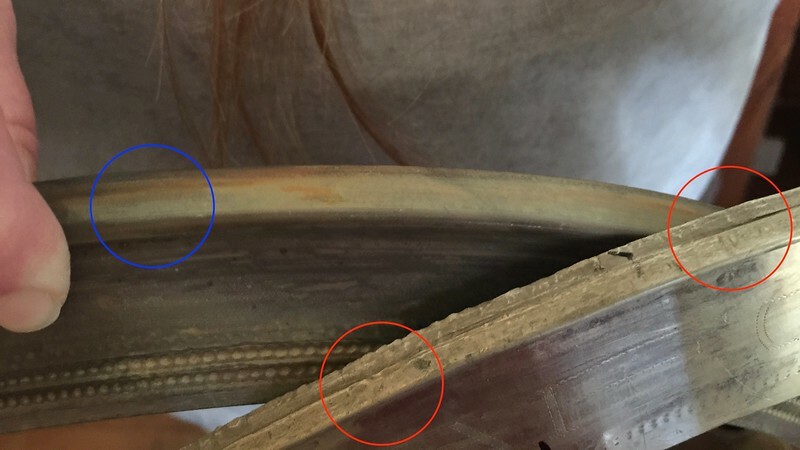 Not only is it misshapen beyond hope (around 50% of the ring's angle no longer matches the angle of the end of the Miraphone bell flare) but the edge is pretty much destroyed, so it would never hold its position correctly. Here is my new thumb ring base. Here is the base that will be replaced. (The horn came to me lacking a thumb ring, so there is a brand new one in the old base right now.) I am not sure why the base was cut and moved to this location. It is cocked so far out that it would put the thumb about three inches from the thumb lever I am about to add. I have pretty big hands and there is no way to hold this without the thumb being stretched all the way out to allow the fingertips to contact the four platens. Dan Myer, you have some BIG paws, man. HAHAHA!!! 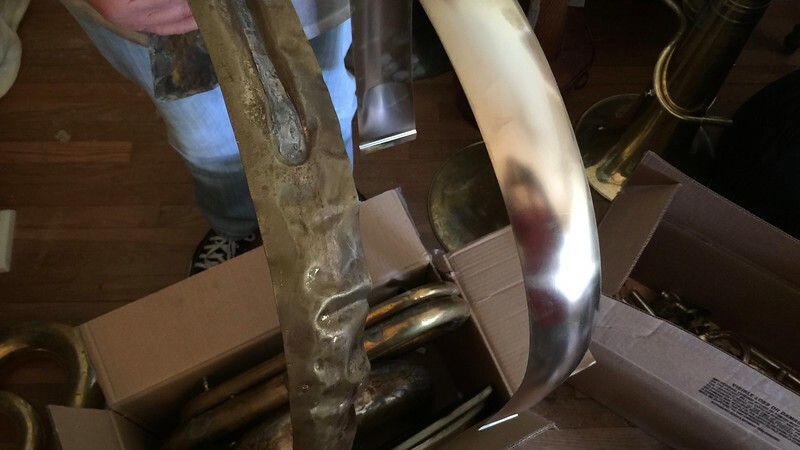 Here is the old MTS crook from the BBb parts tuba with the new one. Note the ends of the new one retain the original length and have the marks from the hydraulic blow-out press. 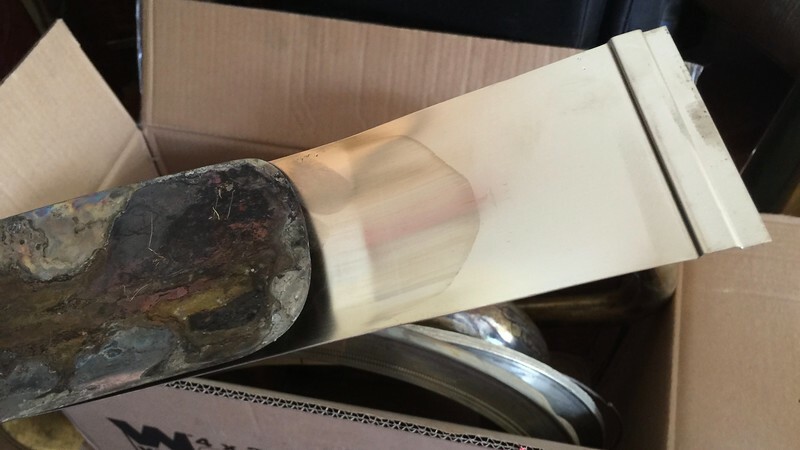 Note also that this part has not ever been buffed, so it is thicker than on a new horn and it looks like garbage. Here is the old keel. I was going to try and reshape it. The photo does not show how it is laterally twisted, and I just don't want the bother. I now have other plans for this old hunk of nickel silver, anyway. This new one will do nicely in its stead. 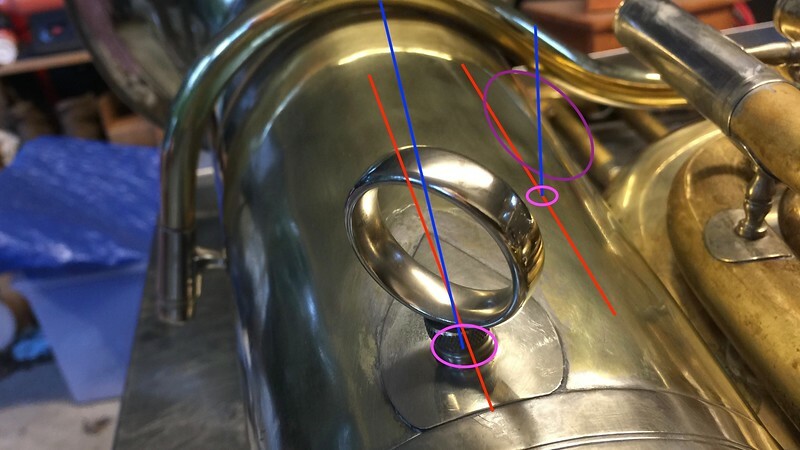 This photo shows you where the thumb ring base is now and how it was trimmed to fit that spot. 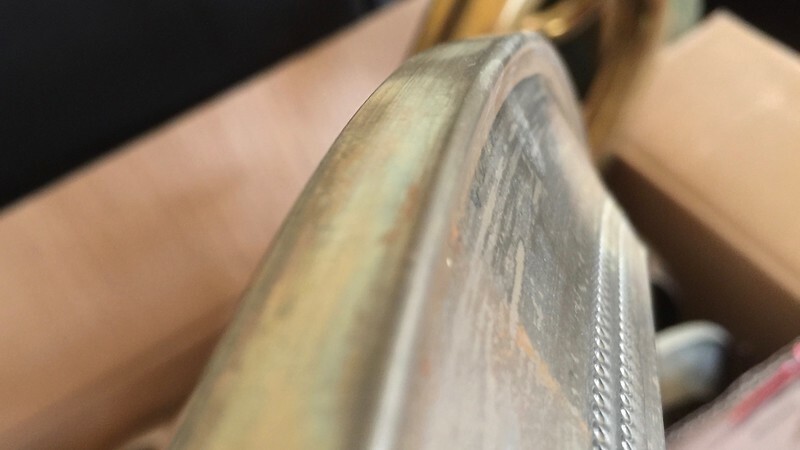 You can see how far I have to move it to be able to reach the Miraphone thumb lever I have. I heard back from Eva at Miraphone. I was waiting for a quote, but that was misunderstood, so my "order" has been packed and is ready to go. This includes the engraved Kranz, which I wanted to know more about before ordering it, so I have to get it even if it looks different from what I want. <sigh> And the engraving was about $25 more than was originally quoted. But the leadpipe was about the same amount cheaper, so it all evened out in the end. There seems to be one part left off the statement, so I have asked her to look into that. This should take about a week to clear up. So I will probably be paying for this stuff on the 30th. The leadpipe is the small/medium one used from about 1974 until they changed the design of the horn and the leadpipe and bell got larger. It is not what I had hoped for. However, I want to use this horn for quintet and recitals and such, so making the leadpipe connections removable will allow me to use all three and figure out which one I like the most. I have the 188 nickel silver pipe, the current 186 pipe and this 1974-ish small pipe. This should be a barrel of laughs. the elephant wrote: The leadpipe is the small/medium one used from about 1974 until they changed the design of the horn and the leadpipe and bell got larger. It is not what I had hoped for. 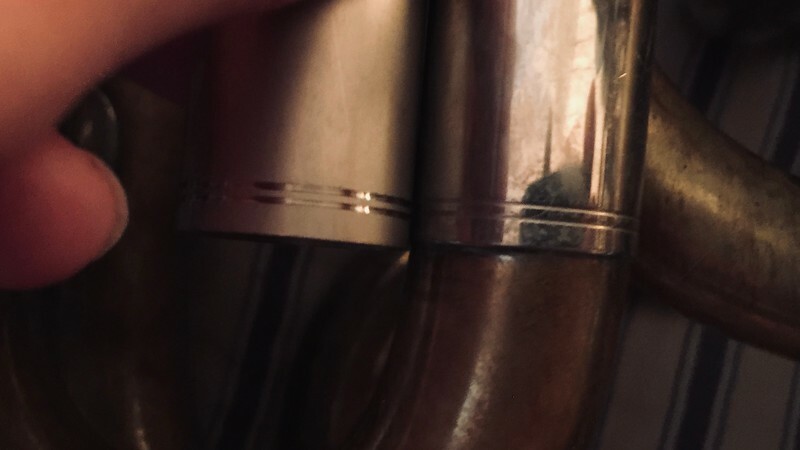 However, I want to use this horn for quintet and recitals and such, so making the leadpipe connections removable will allow me to use all three and figure out which one I like the most. I have the 188 nickel silver pipe, the current 186 pipe and this 1974-ish small pipe. I like the response of the smaller lead pipe on my Bessophone. It has functioned just as well for quintet as for supporting a moderate sized concert band. You may like it also, although I do understand having a fitting so you can have options. Well, I have always *hated* that leadpipe. I greatly prefer the lager one it replaced. 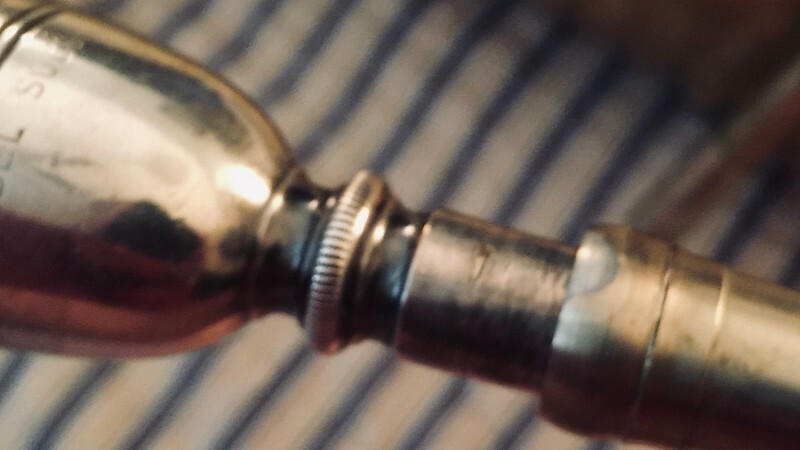 Further, I have read several reports that this smaller leadpipe works poorly on the older horn, which was slightly rewrapped when this smaller leadpipe came into use. So the horns themselves are a little different, so the leadpipes should not be mixed between generations of 186 tubas. Let us call the 1968-1973 (again, very "-ish") generation B. They were the first gen to be really consistent. The first generation had a lot of inconsistencies that caused them to play fantastic or doggy. Generation B seems to be the first series of these to get really cleaned up. They are the horns that broke into the US market in the early 1970s. Generation C would be the ones made with the alterations and the smaller leadpipe. Then seem to have made these horns play even better with improved intonation and response and a sweeter tone, but they are the ones that gave the 186 the whole "tearing metal" reputation for playing above forte. They are fantastic in groups but not fun if you are the only player in a large group because the horns wants to get so damed edgy at higher volumes unless the player has his chops fully dialed-in. Generation D would be the ones from the 1980s, and so on and so forth. After the horn was again changed in the 1990s I have lost track of what has been done and when. I know the dates for the DVS, Presto and Minibal systems, but I don't know when they used the nylon Minibal links versus the nickel silver ones used today. I do not know when the larger bell and leadpipe came into regular use. 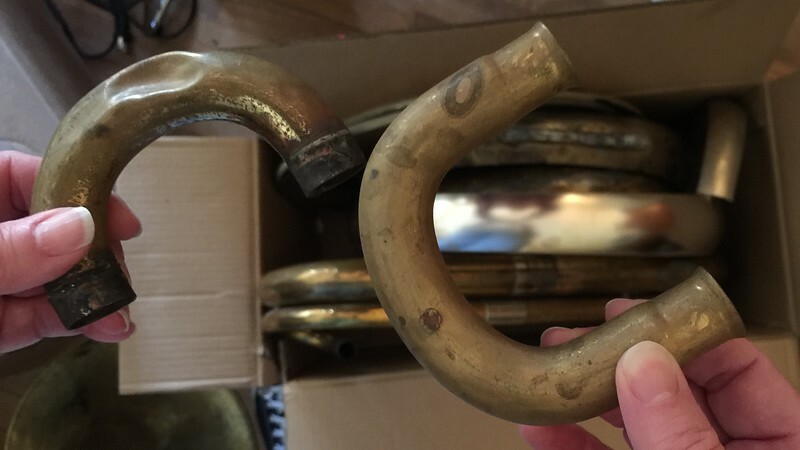 I just know a few things about the old horns, and I have played (daily, for multiple years) or owned ten of them over the past 40 years and had done a lot of corresponding with Miraphone back in the 1990s. 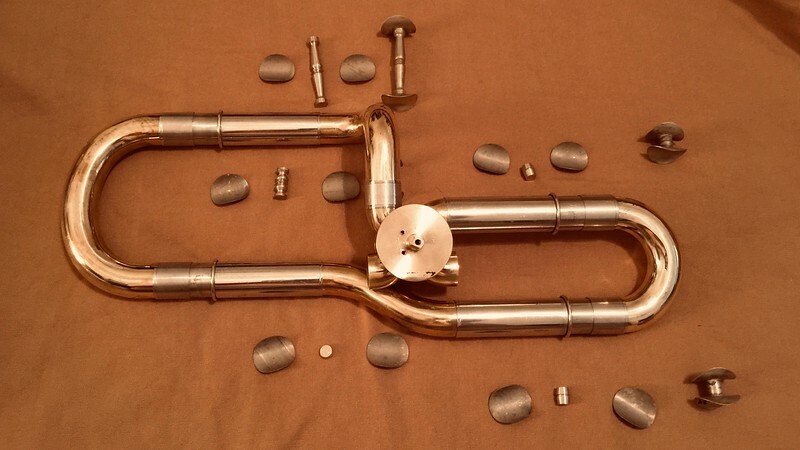 Anyway, I would not want to put the smaller leadpipe on my horn, but hey, I took a chance and bought it. I have not fully bent such a long, complex leadpipe in many years. I have done a few, but that was in a fully equipped shop with forms and such for bending this exact part. I will have to make my own forms because I am NOT "free-handing" something this old but still unbent. I would look at it as a crime against old 186s if I messed it up. HAHAHA!!! My particular 186 plays *very* well with the current, larger 186 leadpipe, which I have heard is pretty close to the older, wider pipe from the 1968-1973 (-ish) horns. Maybe it is close enough that it mimics the original pipe pretty well? The 188 leadpipe is fantastic on this tuba, but it is way too wide. 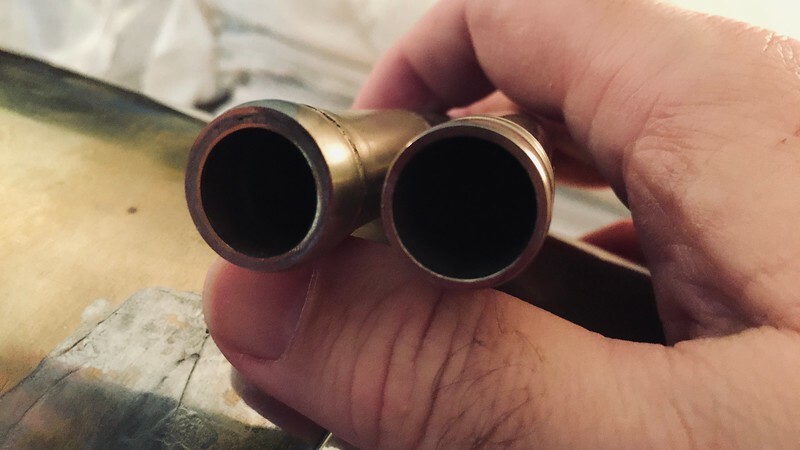 I am not experienced in bending nickel silver, and am worried I might screw it up, but I am going to repair this pipe and try very hard to not F it up by bending it in two places to better fit this smaller horn. Then I will have the big boy pipe, with the best intonation and response and the ability to play much more loudly, I will have the current pipe from the modern, larger-belled 186, and I will have one of these smaller, sweeter pipes. Making these interchangeable will make this tuba a real fun thing to mess around with. I am *very* interested in see how this plays out. However, the leadpipe is way down my list of things to do. My 5th valve slide loop parts should ship soon, and that is No. 1 on my Hit Parade. Aaaaaand Chuck just fired off the parts via FedEx, so I will have them next Tuesday. The Jinbao parts arrived about an hour ago. Wessex is setting up a Parts Department and I think I am one of their first customers. Chuck and Steve took care of me, too. The box arrived today and everything was *carefully* wrapped up. I was, in a word: impressed! All the parts are well made and were finished and cleaned. No having to measure and trim the ends of the crooks. No buffing or sanding needed to get the parts to a finished state. Uh, except for the braces, which JB does not like to sell assembled. What you get are the cast brace pins and the cut and rolled brace flanges and you then have to trim/file them to fit and then put the parts in a silver soldering jig and hard solder them together. 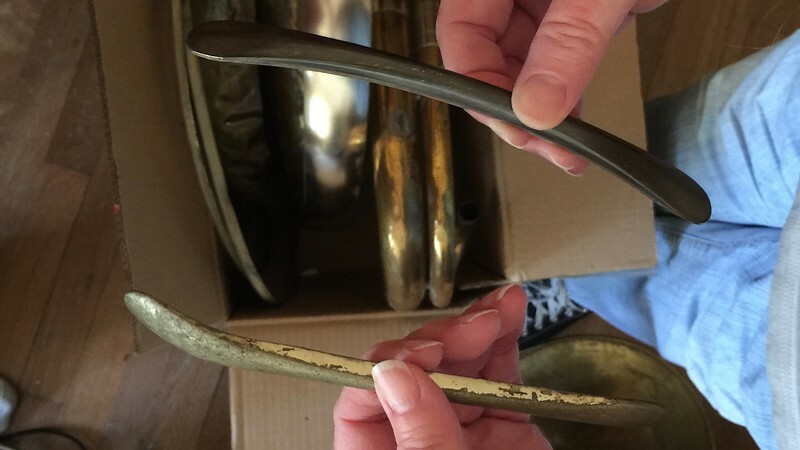 If you will recall, though, the Tuba Exchange used to sell the same 410 tuba and they also stocked up lots of parts. The argued with JB for some time and finally won out, receiving preassembled braces that could easily be dropped into a box and shipped off to a shop for easy installation. There are five braces needed for this slide loop, and TE happened to still have four of them in stock. However, one of them is assembled poorly and I am not sure I want to have to mess with the flanges to get them to fit correctly, so I will use my Wessex-sold parts to make the missing brace as well as one to replace the funky, longer brace. So I have just about everything I need to install a complete 5th valve on my 1971 186-4U CC tuba. 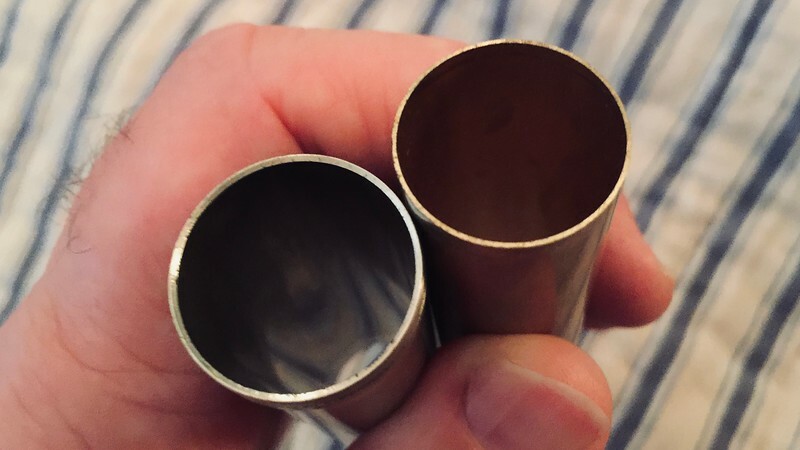 I still have an order from Miraphone coming in, and that is mostly large trim pieces, but there are two needed parts for relocating the 1st slide that I need. I am hugely busy with the orchestra right now. In January and February I have 43 performances or rehearsals with the MSO, the MSO Brass Quintet or Capital Brass. I still have my normal teaching load, too. So working on the horn right now is not a priority. I don't think they are up and running with this, yet. I would contact Chuck privately to see whether they can help you. I only got to do this because they happened to be in China when Chuck read my posts about what I was looking to do. He offered to let me order what I needed and brought it back with him to the US. 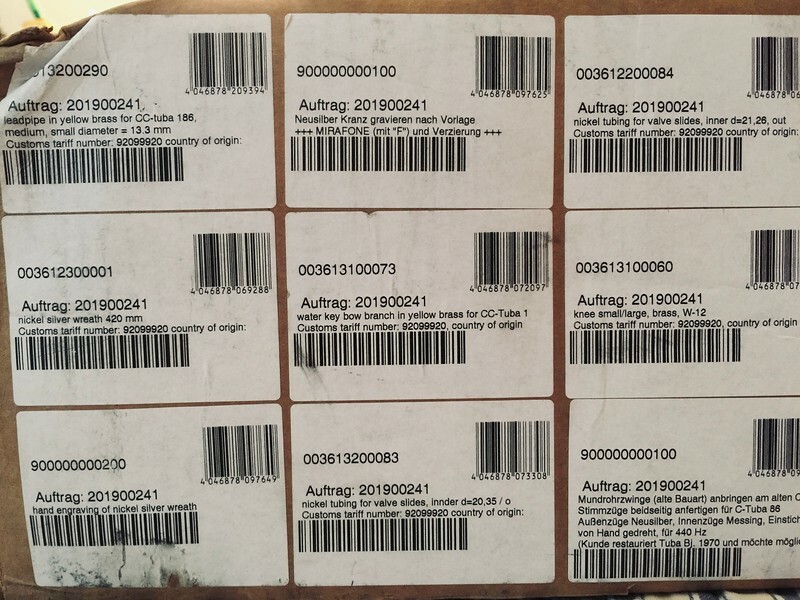 I think I was the guinea pig for setting up a system to sell parts (shipping, billing, etc.) and I got what I needed specifically because they were where they could just pick my order from bins. I think he brought back a lot of parts, but I am guessing that your horn's bore size is probably smaller than what he has at hand. It never hurts to ask, though. Good luck! Miraphone collected my money two weeks ago. No word as yet except to confirm receipt of my funds. 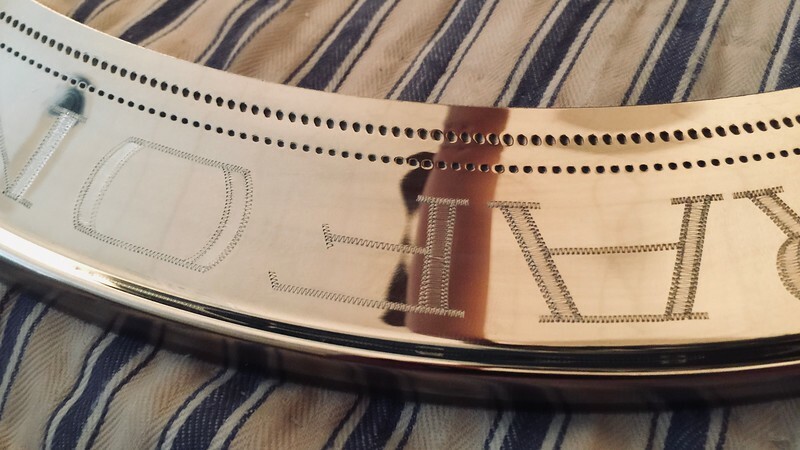 I am fairly certain the hangup is with the engraving since they had to outsource that work. More info as I get it. Well, I think they forgot about my order. I asked about it in an email early yesterday morning and received a reply early today saying it was being shipped right then. So it must have been sitting there and they got busy. No word on the engraving. Anyway, it has not actually been scanned in, but the DHL driver *is* supposed to pick it up today. I hope. I am GLAD to have this project rolling again, even if by rolling I mean that the parts have finally shipped. At least by the end of March or this time in April I can start work. I hope to have all this stuff done by a May band concert. I have to use this horn sans a 5th valve for The Planets pretty soon, so I have to perfect the slide pulls for low F. Low E is nails. I have already worked up all the excerpts to passable. I will polish the part this week while we are on break. This horn has proven to be very, very useful, replacing a lot of my other horns. I used it in a quintet service with full choir this past Sunday. It worked better than my F in this setting, which was mostly in the staff and below. Had there been a few less prominent low Bbs I would have used the Kurath, but that note is squirrelly on that horn and it is like coming home on the 186, as you would imagine. Once the parts arrive I will start posting again. Excellent news! I am happy to hear that your CC is working out so well for you. Full Steam Ahead! No work to report, but parts, parts, parts! First, the expensive engraving: I am disappointed that it does not match what they did back in the day. They must have sent over an image or a photo rather than an actual template. The "font" (not really the correct word, here, but whatever) matches exactly, but the engraver made the letters much taller and much more narrow than what Miraphone used, so far as I can tell, EVER on tuba bells. I expect no one there now remembers how these looked. They all look to be very young, and the do not offer this any longer, so no one there has ever actually done the work. 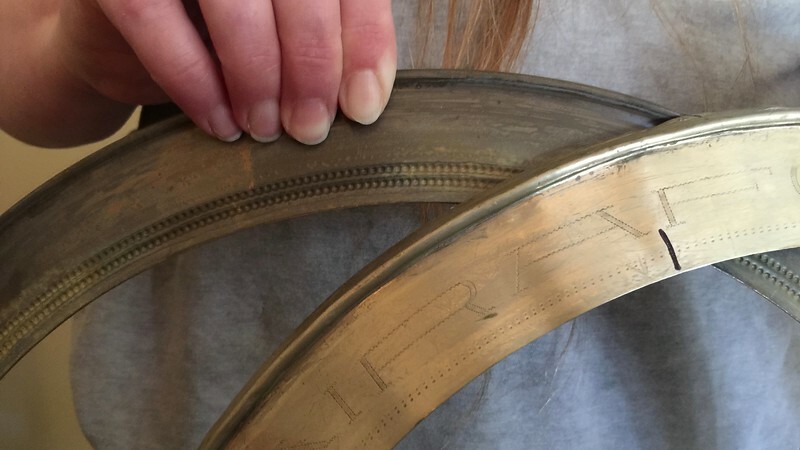 They had to send this out to an engraver, and he did a FANTASTIC job, but it really looks like a copy by someone who has never seen an original and who does not realize how important it is for his work to match that original. I guess Miraphone no longer has any of the old templates or any examples with measurements. I find it weird that the guy nailed all the details but when looking at the letters it is like seeing a modern aspect ratio video squashed to fit into the old television aspect ratio. It is all squished in from right and left and stretched too tall. This is what I got. Again, I am very happy that my old Mirafone will not have a blank garland. The work was beautifully executed. However, it does not look like Miraphone's work. It looks exactly like what it is: outsourced. I am disappointed, but I am also happy. I am grateful that I was able to get this done. But I could have had a local guy get the same results just as easily. In fact, he could have done a better job because he could have had the horn right next to him for measurements. So, lesson learned. If a company says a service is no longer available don't let them send it out to someone else because you don't know what you will get and the price will frequently be a lot higher that it needs to be. Still and all, I will install this on my horn as it is. I like it. I just don't love it. Here are the two new garlands together. The ugly one will look exactly the same once it has been buffed properly. The ugly one is from Badger State Repair and is exactly how Miraphone sells them today: blank. And the "aftermarket" engraving on the top one will look just fine on my tuba. The blank one will go on the heavily damaged bell from my BBb parts horn. Ferrule. (Juuuuuuust a bit too long…) The figurations have changed many times over the years. I sent them photos and they did an EXCELLENT job of copying mine, which were eyeballed by the worker back when all this stuff was hand-work and not programmed into a computer. I am pleased. These ought to buff up and mellow to look exactly like mine. This one is not exactly the same, but it is really close (and both tubes match exactly). Sorry for the crappy photo, but I am too lazy to go back and reshoot several of these I took today. "It stays as it lays." 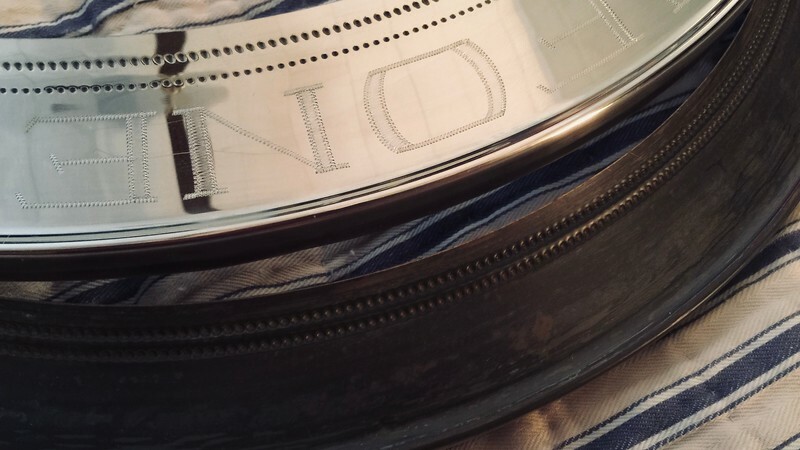 Anyway, so far as I can see under a magnifying glass and strong lamp (otherwise I am just about blind) the outside ring is beveled at the same point to the same degree, but the inside edge was not filed down and has a little lip that the old one dies not. It is less "clean" looking, but it still looks WAY BETTER than using blank tubes. I will take it! The other end of the slide leg also matches exactly. Once buffed the sharpness will mellow and they will look like they had been made by the same guy at the same time. That is really nice. 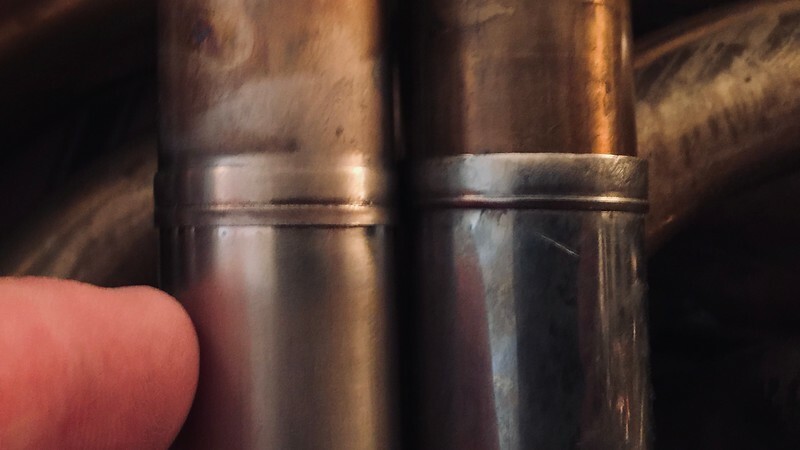 The old and new tubes are also *exactly* the same length — very precise. They differ by two thou, and the new ones were computer cut or the worker is a very precise guy, because the two new ones mic-ed out to the same length out to thousandths of an inch. That is impressive to someone like me who has to hand cut every tube and is excited when a pair match to within a half millimeter. Here are the other parts. What you see is the new water key branch, which is the dark tube, from annealing and then a little bit of hydraulic blow-out action. It is straight to the bend, expands in the crook, and seems to be the larger MTS size right after the bend. 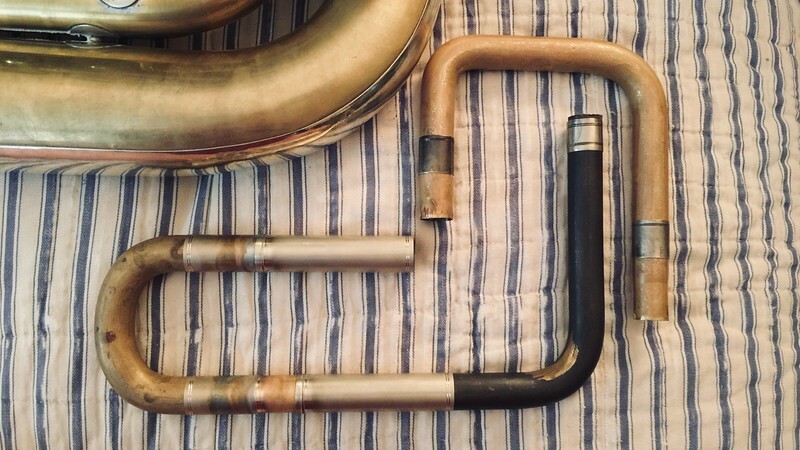 I did not measure it carefully, but I think this new style differs from the one on my horn, which was an evenly tapered tube that was annealed, filled and bent, whereas the new one seems to have been a straight tube that was annealed, filled, bent and then blown out to the needed diameters. The old one started out at the correct taper and the new one had the taper added afterwards. In this photo it is way too long and needs to be trimmed and dressed to fit in its new home. This is press fit into the new outer MTS leg. The slide is assembled and everything fits very nicely. I bought the new crook from Badger back in January. So he probably had that thing in a box for ten years. 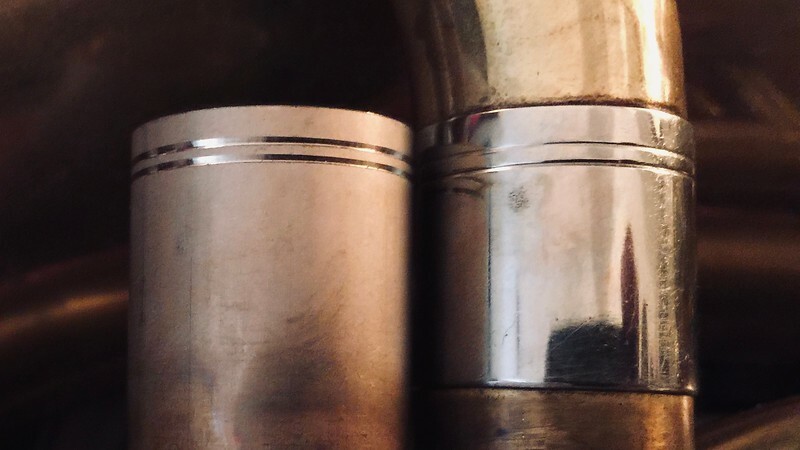 It is always impressive when you take two parts that must mate up perfectly, with fairly precise tolerances between them but that were made by different people possibly a decade apart, and they fit perfectly. Nice, Miraphone! The other end has a ferrule used between the rotors and the leadpipe or waterkey branch. It is off a mid-1970s 186 BBb and fits, again, perfectly — just snug enough to ensure a proper joint once filled with solder. Above that on the right (the weirdly shaped tube) are the two "knees" for the first slide. The tightly radiused end is the branch for the top port and the more widely radiused end is the other one. The whole 1st valve slide has to move over a quarter inch to make room for the lower port tube for the 5th valve. These will allow me to cut these tubes to fit exactly, so there will be no gaps inside the ferrules. The gaps won't really make much of a difference in how the horn plays. But the knees would have almost no purchase inside the ferrule, so they could break if too much pressure were to be applied to the slide, and I am always on the 1st slide. Better to have new parts that are too long and can be trimmed to fit. I have some of the 1971 ferrules that are used between the inner slide leg and the crook on both ends to check fit. Again, perfect. Just a tiny bit snug. I think selling the two knees as one tube that you cut to fit is pretty clever. I had to cut the post in half due to post length requirements. Here is part two, which is solely about the special leadpipe. I had asked them whether they could make me a new leadpipe the old way and shaped correctly for this tuba. They said they no longer had the forms used for shaping these slightly narrower leadpipes. 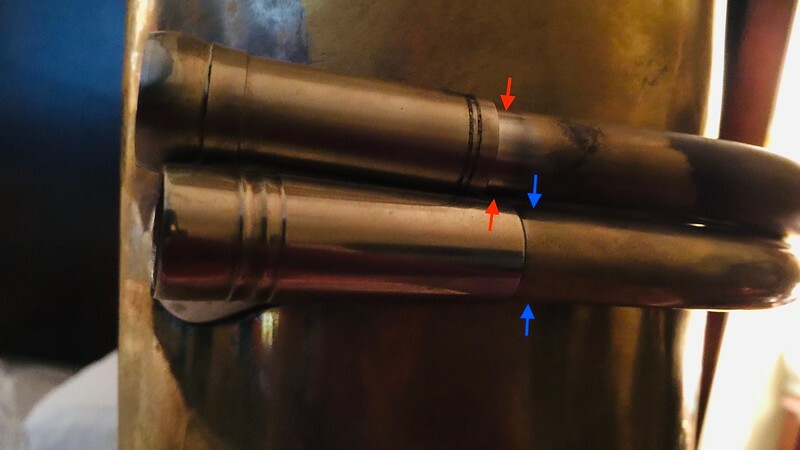 (The width if the tuba from the straight part by the valves to where the pipe curves around the bell differs today, and the pipe also wraps more tightly on the old ones. 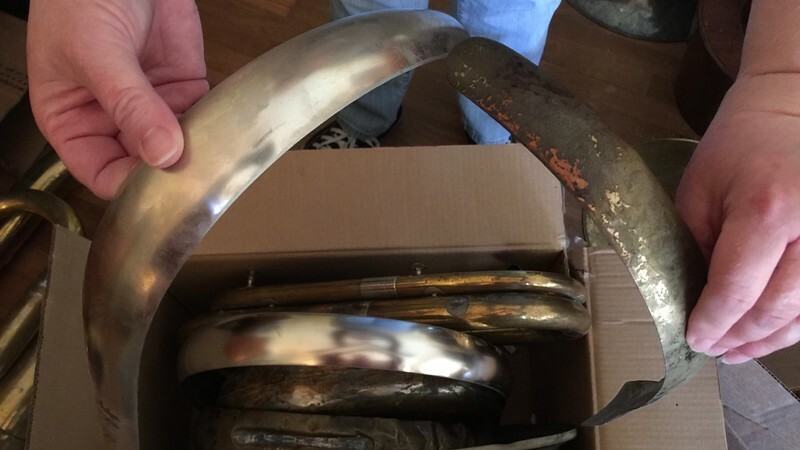 The new horns have lifted leadpipes, which, to look correct, are wrapped around a larger diameter "bell" mold. This tuba currently has a modern leadpipe, so it fits nicely, but touched the bell where it comes off the top bow, but then wraps out into space off the bell by the receiver brace. It fits nicely if you do not mind it looking a bit odd. Anyway, Eva informed me that they cannot make those pipes correctly any longer because they tossed the old forms. About a week later she contacted me to say that a worker had been digging around in boxes of old stuff and found one last 186 pipe from the old days. However, it was the Medium/Small size used from about 1974 on up to the redesign (when the bell was made to have much less contact with the top bow and leadpipe and, therefore, required that a new, slightly wider leadpipe be designed). I am making a big assumption here, but I think this is also when they moved over to the larger bell diameter. The new leadpipe starts at a larger diameter and plays a lot like the older, larger leadpipes used before about 1974. 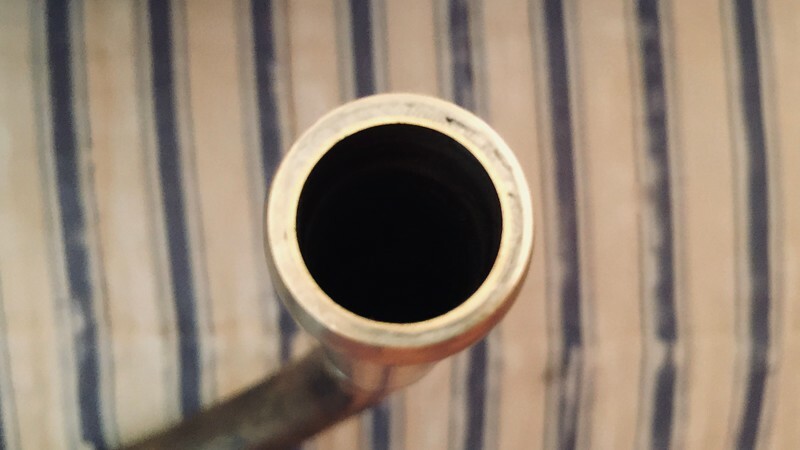 [WILD-ASSED ASSUMPTION TIME] So the new (currently installed) leadpipe seems to play much more like the leadpipe that came on this tuba than the one I just bought, which is the version used starting some time around 1974. I am assuming that they moved to the tighter leadpipe once they nailed down some flaw in the horn and felt that some redesign in the wrap or taper or whatever they did also merited a change to the leadpipe. I have noted that horns from before 1974 that use the fatter pipe play very well but need more intonation correction. They play bigger and do not tend to sound like classic 186 "tearing metal" when played loudly by younger players. By way of comparison, from 1974 until the redesign the horns play better as a whole, but they are more soloistic, in my opinion, and they bark like big dogs when pushed too hard. They are much better when used in a section setting where obscenely loud playing is never required. They play together more consistently in pitch and tone, and for a band were just a better choice. Using the wrong era leadpipe taper on these older horns seems to result in a horn that does not play very well, IMHO. The bigger leadpipe never works on the later horns, and the smaller one improves the older horns, but they lose some of their "mini-Alexander" grunt and projection. In my observations, the older horns like mine tend to be better in an orchestra, where you need to sound like a rather robust tuba and the player is trained well enough to play in tune regardless of the instrument's tendencies. The 1974-and-up horns with the tighter leadpipes seem to be an improved version aimed at section playing in bands where they are used more as the ensemble bass voice rather than a soloistic sound used by orchestral composers. Again, this is all based on personal experience playing these horns since about 1979 or 1980 in many settings. I am a complete geek and keep records of serial numbers of horns I have played. (My high school sousaphone was a Conn 14K, #C66363. I am very odd in this way, heh, heh…) So I know the year model of every 186 I have ever had issued to me. And I remember exactly how all of them played and what mouthpieces I used. I also know my skill level on each of them, so I can sort of filter my memories and notes and such, which is where I get some of my goofy ideas from. So I currently have three leadpipes for this horn. It came with a 188 leadpipe. 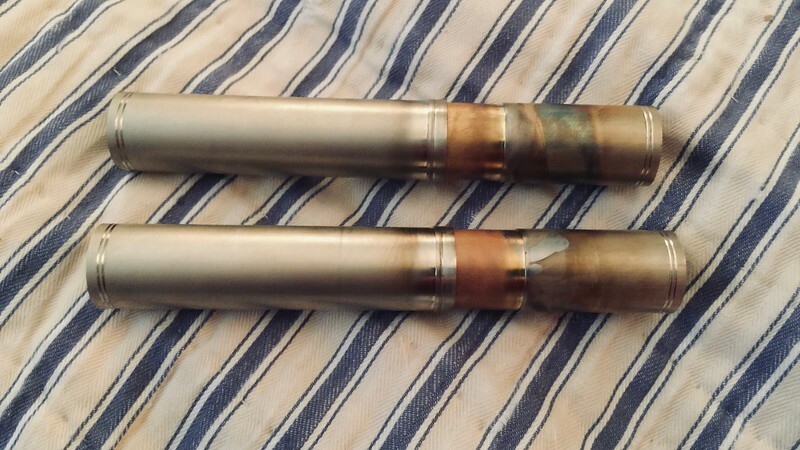 The previous owner purchased a 186 leadpipe from this seller, but I know from repeated experiences with this vendor that he sends out the wrong stuff more often then I would like. I have to tell him what the measurements and materials are for some of what he sells. Sometimes I have to sit on the phone while he sifts through the bins of parts to find exactly what I want, which is identical to what I had just purchased, but he cannot find what I purchased, and I have to help him identify and piece together my order. And then it still arrives with mistakes. It is just the way this stuff goes, sometimes. With that in mind, after meeting with a friend who has a 188 so that I could make some measurements, I know that this pipe is definitely for a 188. Fine. No more discussion on the leadpipe. I have a couple of people who keep telling me that it is a 186 pipe. I suppose it is for a special 186 unlike every other one ever made, then. So, this 188 leadpipe made me LOVE this tuba. The thing was all bent up the the previous owner, and he did a pretty good job of getting it to fit this tuba, too. So I intend to finish what he started and fully fit this pipe to this tuba. I will be making forms for this based on the perfect fit of this brand NOS leadpipe. I will also make the currently installed, modern 186 leadpipe into the same curvature. 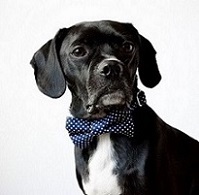 Then I will have to fabricate some special braces and a collar to allow them to be swapped out. Then I will have the small pipe for quintet or solo work, the 188 pipe that lights my fire in the orchestra, and the one I have on there now, which is really decent, but is sort of "meh" like the new design 186 horns. I suspect that most of the "meh" reaction people have to these newer 186s comes from the larger bell and leadpipe, which I think do not go together very well. Anyway, I will post some leadpipe pics, now. First, the new "1974" pipe was not trimmed at all. I requested the old style receiver, as Eve kindly offered that to me. However, I believed that this was a cosmetic, external difference, or perhaps a taper difference. No. She meant *really* old style that I did not even know Miraphone had used. 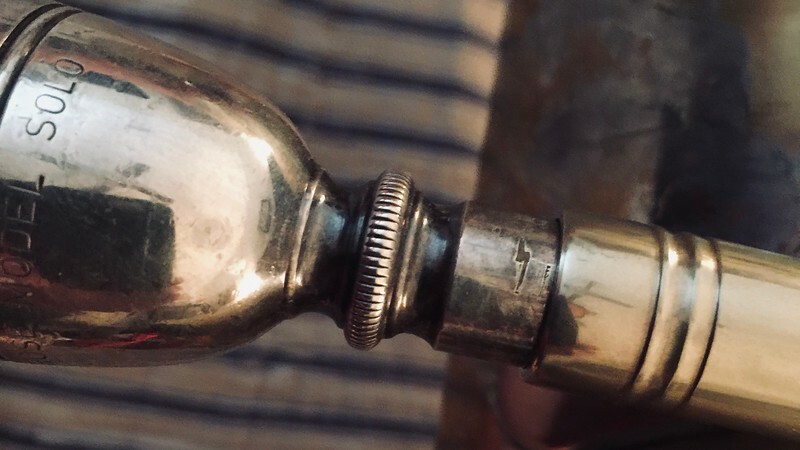 This is the style where the pipe end is stuck on a mandrel with the nickel silver receiver sleeve in place, and the pipe itself is flared to receive the mouthpiece. The receiver is actually just for reinforcement. There is no step, no gap, no nothing — just a slight reversal in taper direction. Please note that, yes, I have the tools to open up the receiver end a little to allow use of a modern shanked mouthpiece. No problems, there. I have done this a number of times. Also note that the option of using a modern receiver is also in play. 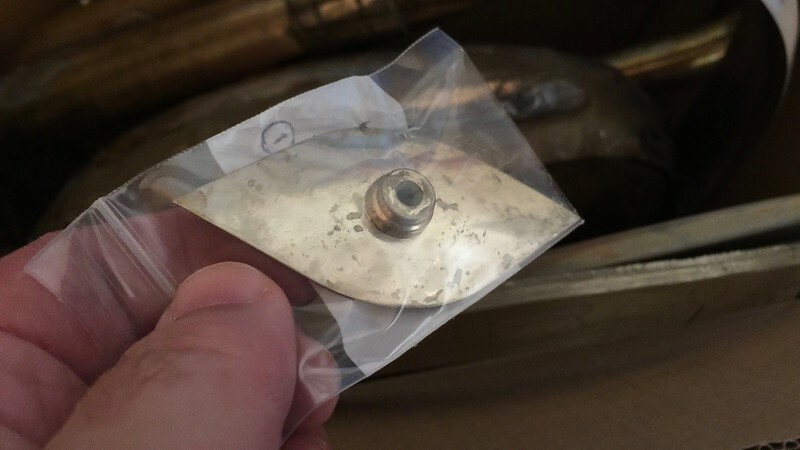 I have a brand new Miraphone receiver and would just need to remove the old receiver sleeve and trim the small end to the correct length and solder on the new receiver. That is all for now. I will try to get back to work. I have The Planets coming up, and I will be using this tuba. I might try to get the 5th on before, but I am afraid that it will change something in the negative and do not want to risk that. So more than likely I will leave the horn alone until the end of the season, or perhaps I will install the valve so that I can test it out during our springtime spate of runout concerts. They are low pressure, generally have some big low brass stuff on them, and I will have a mic at most of them, I don't have to worry about any differences caused by the addition of the valve. (I don't think there will be any, actually.) Also, if something odd happens I can play my excellent Mack 410. The restoration continues! Keep up the great work! I will be getting a new tank of acetylene on Wednesday and starting back up with these horns soon after. I have been super busy and still have about 15 freelance gigs, MSO rehearsals or performances to go this season. Then I can really tear some things apart and start fixing them. Tonight we played The Planets (amongst other things). I was presented with a plaque. It was fun.